JCMC PARTNERS WITH BOMBAS SOCKS FOR WORLD HOMELESS DAY - Jersey City Medical Center partnered with Bombas Socks to raise awareness of World Homeless Day on October 10, and to help meet a crucial need of Jersey City’s homeless population. 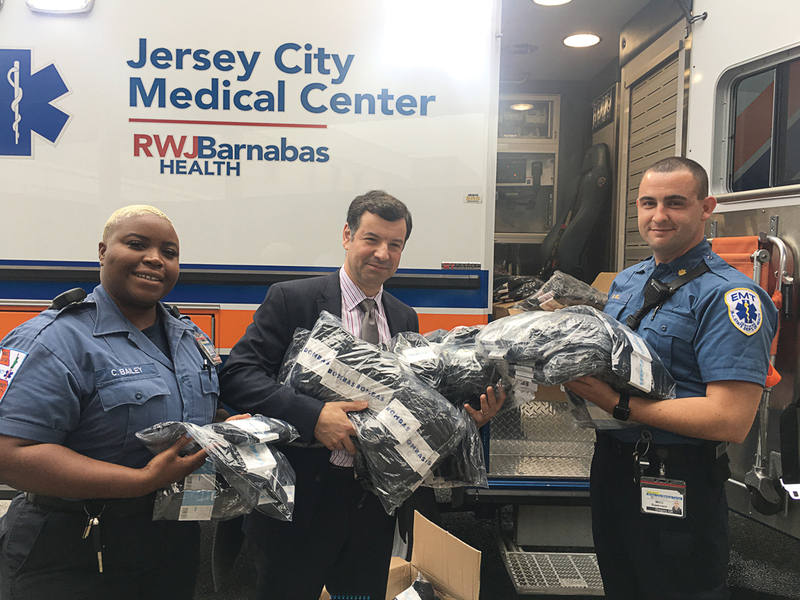 Jersey City Medical Center received a donation of 750 pairs of Bombas Socks, which will be distributed through local shelters and through the hospital’s EMS and programs serving the homeless population, such as MASSH/PATH (Medical and Social Services for the Homeless/Projects for Assistance in Transition from Homelessness). Pictured here: (L-R) Chantal Bailey, EMS Field Training Officer, Michael Prilutsky, President & CEO, and Gregory Gill, EMS MICU Supervisor. Jersey City Medical Center has announced that Michael Prilutsky, chief operating officer, will assume the position of president and chief executive officer. This elevation received the unanimous support of the JCMC Board of Trustees. Prilutsky succeeds Joseph Scott, who will take on the full-time role of executive vice president, office of healthcare transformation, for the RWJBarnabas Health system, a position that he held concurrently for the past year while serving as president and CEO of Jersey City Medical Center. Scott will lead population health, strategic initiatives and business development efforts for the RWJBH system. U.S. Secretary of Education Betsy DeVos announced in early October that McNair Academic High School has been National Blue Ribbon School for 2018 for the school’s overall academic performance. Students cheered as their school received this prestigious award. McNair, which was also recognized as the highest performing school in the state of New Jersey, received this national recognition as an Exemplary High Performing School. Since 1982, the US Department of Education has identified and celebrated excellence in education through the National Blue Ribbon program. This year only 349 schools from across the nation including Puerto Rico, the Virgin Islands, the District of Columbia, and Department of Defense and Bureau of Indian Education were selected. The award is given to recognize excellence in performance and in closing achievement gaps, and helps highlight effective teaching and learning at all grade levels, in all geographic settings and with all students. Last year, Academy 1 in Jersey City was recognized as a National Blue Ribbon School for 2017 for its success in closing achievement gaps. Hudson County Prosecutor Esther Suarez has announced that her office will hold a Gun Buy Back program simultaneously at two safe locations on Oct. 20. The program is co-sponsored by the New Jersey Office of the Attorney General, the Jersey City Police Department, and the Union City Police Department, as well as a corporate co-sponsor, the Jersey City Medical Center-RWJBarnabus Health, and two faith-based hosts. Hudson County residents can anonymously surrender a maximum of three firearms for up to $250 cash per weapon. No questions will be asked. The event will be held from 8 a.m. to 5 p.m. at two safe locations — Heavenly Temple Church of God, 15 Martin Luther King Drive in Jersey City, and St. Anthony of Padua Roman Catholic Church, 615 8th Street in Union City. Law Enforcement Officers will be stationed at both locations to assist with the valuation of the weapons. They will also help to collect and secure all firearms. The Hudson County Gun Buy Back program is part of a larger effort to keep New Jerseyans safe from violent criminals by the New Jersey Office of the Attorney General and the Prosecutors in each of New Jersey’s 21 counties. On Sunday, Oct. 21, Cuteticles will hold their first annual “Cuteticles Breast Cancer Awareness Event” at the Cuteticles Loft, 389 Central Ave., second floor. October is Breast Cancer Awareness Month, and Cuteticles is teaming up with the American Cancer Society to fight breast cancer together. The shop will donate 50 percent of the proceeds for services provided during the event to ACS. No appointments will be necessary on the day of the event. Services will be provided on a first come, first serve basis. In addition to offering their great services in personal care, Cuteticles will be raffling fun prizes and selling t-shirts as well. Refreshments, snacks, and great music will be provided. To learn more about Cuteticles Nail & Spa visit www.Cuteticles.com. Ingrid Griffith will read from her new play “Unbossed & Unbowed” about former Rep. Shirley Chisholm at Merseles Studios in Jersey City on Thursday, Oct. 25. Chisholm, who dedicated her life to fighting for the poor, working class, people of color, and women, was one of the most unlikely and groundbreaking politicians of the 20th century. She was the first African American woman elected to congress in New York, and served seven terms, and was the first black candidate for a major party’s nomination for president when she ran in 1972. 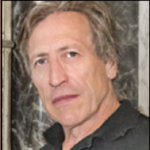 This solo show has been in development for three years and the presentation by Jersey City Theater Center (JCTC) will be the fourth public, staged-reading of the play – following a high-profile, well-received reading last August at Broad Views on Broadway, Living Room Reading Series in Brooklyn. Doors open at 7:30 p.m. with show to start at 8 p.m. The suggested donation is $75. For more information or to purchase tickets visit: www.JCTCenter.org. Jersey City Theater Center/Merseles Studios is located at 339 Newark Ave. in Jersey City. Surati for Performing Arts in partnership with Art House Productions Presents the Lights of Diwali Festival on Oct. 24 to 27. The four-day extravaganza will feature live performances of the musical “Ramaavan,” a street fair and cultural bazaar, culminating in a Diwali indoor party. Geared towards educating the community about Indian culture and providing a platform for new and aspiring talent to showcase their art, the festival celebrates light over darkness and good over evil with several distinct events, including four presentations of the musical “Ramaavan” at Art House Productions, 262 17th St. in Jersey City. The festival includes a Diwali Mela, cultural bazaar and street fair on 17th Street, between Coles Street and Jersey Avenue, Jersey City, and Diwali Spectacular-an indoor party, at Art House Productions. For tickets and more information please visit www.suratifpa.org. “Ramaavan” is an original musical conceived choreographed and directed by Surati’s founder and artistic director, Rimli Roy. Ramaavan runs for four performances at Art House from Oct. 24 – 26 at 7:30 p.m. and Oct. 27 at noon. Tickets are $25 general admission, $20 students/seniors (with ID) and $15 for children 3 to 12 years old. For more information visit www.suratifpa.org. The Kennedy Dancers and No Peeking Theatre are teaming up for the Halloween season to create a Haunted Studio Tour and Party. This event is a fundraiser for both organizations’ future projects in the upcoming season. The Haunted Studio will be a sensory haunted tour through the studio, where something sinister happened to a young ballerina many years ago. Follow her apparition and discover her story on Oct. 27, the anniversary of her untimely and mysterious disappearance. The Haunted Studio Tour will conclude with a Halloween party that includes a costume contest, candy, food and drink. The Haunted Studio Tour and Halloween Party will be held at The Kennedy Dancers, Inc., 79 Central Ave in Jersey City from 7:30 to 10 p.m. Tickets are $12 in advance and $15 at the door. Tickets can be purchased online at either organization’s websites: www.kennedydancers.org or www.nopeekingtheatre.com. Tickets can also be purchased over the phone: (201) 659-2190. Tours will be given every 15 minutes and all audience members will be ushered immediately to the party at the conclusion of the tour. Harborside Jersey City will hold two Halloween-related events. On Oct. 26, there will be a Harborside and Lutze Halloween Party at Harborside Atrium which will include a celebration, including food and drinks, music, costume contests and prizes from 8 p.m. to 1 a.m. Harborside Atrium is located at 210 Hudson St. in Jersey City. Tickets at the door are $30. On Oct 27, Harborside will host JC Families Halloween Spooktacular Parade and party, a family-friendly Halloween event from 4–8 p.m. also in the Harborside Atrium. Activities include a costume parade, dance party, puppet show, face painting, Halloween themed entertainment, and more. Admission will be $5. Guests can register for tickets at JCfamilies.com. A reading/publishing talk will be held with “Byline Bible: Get Published in Five Weeks” author Susan Shapiro and “Carrie Pilby” author Caren Lissner, joined by New Jersey writers Kimberlee Auerbach, Darnell McGee, Cara O’Flynn, David Sobel, Doreen Oliver, and Jennifer Byrne. Includes Q&A on how to get your writing published, for all genres. It’s free and takes place Friday, Nov. 2, 7-8 p.m., LittleCity Books, Hoboken, a six-block walk from the train terminal. Caren Lissner is a Hoboken-based novelist and Hudson Reporter newspaper editor. Her nerdy first novel, Carrie Pilby, was recently turned into a comedy film starring Nathan Lane, Vanessa Bayer, Gabrielle Byrne, and Colin O’Donoghue, directed by Susan Johnson and currently running on Netflix. In the last year, she’s published articles, essays, and humor in the New York Times, Atlantic.com, and McSweeney’s. Her writing, photographs, and advice for writers can be found at carenlissner.com and her photos can be found on Instagram. Her novel is available on Amazon. She has recently given talks on journalism and creative writing at colleges including SCAD Atlanta and the University of Pennsylvania. JCMC PARTNERS WITH BOMBAS SOCKS FOR WORLD HOMELESS DAY – Jersey City Medical Center partnered with Bombas Socks to raise awareness of World Homeless Day on Oct. 10, and to help meet a crucial need of Jersey City’s homeless population. Jersey City Medical Center received a donation of 750 pairs of Bombas Socks, which will be distributed through local shelters and through the hospital’s EMS and programs serving the homeless population, such as MASSH/PATH (Medical and Social Services for the Homeless/Projects for Assistance in Transition from Homelessness). Pictured here: (L-R) Chantal Bailey, EMS Field Training Officer, Michael Prilutsky, President & CEO, and Gregory Gill, EMS MICU Supervisor.